Turns out there are four different Seadog Cruises to choose from. Shelley described each one of them in her Seadog post. The one that most intrigues (and slightly horrifies) me is the Extreme Thrill Ride! The last time we went boating, we actually saw this bad boy in action. It was zipping around all over and doing crazy turns in the water. It looked like so much fun, but scary to a pretty lame tame person like myself! I wish I would have gotten some of my own video, but we were bobbing around in the waves ourselves at that moment! 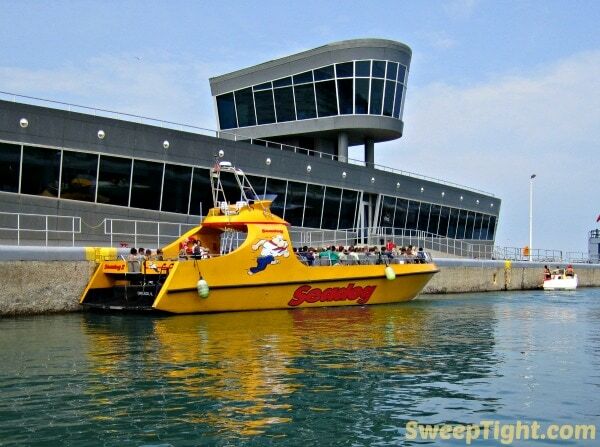 If you are looking for more than just a casual tour of Chicago, grab a spot on the jet-propelled Seadog Extreme. This is an intense experience and more like a thrill ride than a tour. Check out this video to get a feel for it. Seadog Extreme Promo from Drive Productions on Vimeo. This looks like such a great idea for a date night, girl’s night, or any family fun night during the summer in Chicago. What a unique way to enjoy the water. We have a boat, but no way would I trust it to do anything too crazy like the Seadog Extreme does. We will leave that to the pros, thank you! All of the Seadog boats look like a blast. We were in the locks with one and could hear the fun music and everyone really enjoying themselves. I am really looking forward to the Fireworks cruise. Stay tuned for my post and lots of pictures about that experience! >>>Which Seadog Cruise would you choose? Wow, I’ve never heard of anything quite like this before! I can’t wait to hear about your adventure. The Fireworks cruise sounds fun. How cool! Now I have another reason that I want to take my family to visit Chicago. Thanks for sharing the video and photos! i haven’t ever seen anything like this- but how FUN!! i think i’d prefer a fast ride in the daytime – i’m a nervous nelly. I went on this a while back and it was super fun! How fun! If I”me ver in the area I will for sure have to check that out.!. Oh yeah, that speedy boat looks like a total BLAST!!!! This boat ride sounds FUN. They have something similar in San Francisco that I have been wanting to do. I will be in Chicago this month, but I don’t think I can fit this in. Wow this does look thrilling!! I’d love to go on one of these! i am so not a thrill seeker but my mom and my hubby sure are. I bet they would love this!